Home / Blog / Ecommerce / Is WooCommerce the Best Ecommerce Platform for Me? The number one question we get from folks: What e-commerce platform should I use? The second question after our recommendation is: Why? Today we will break down WooCommerce. To answer that question, at Absolute Web Services, we typically start with a clean canvas meeting to understand your needs. However, for the purpose of this article, we are going to review WooCommerce’s pros and cons. This article concludes our initial e-commerce platform reviews. Our next article will be a comparison piece with Shopify, Magento, and WooCommerce results side by side for you to quickly decide what the best e-commerce platform for you is. Let’s start off by offering our humble opinion, WooCommerce is incredible for lifestyle dependent products! No other platform features a richer content management system! Ease of use could not be greater, WooCommerce is a commerce plug-in for WordPress. WordPress has a rich plug-in community, easy to use back-end, and WooCommerce integrates seamlessly. If you are looking for a flexible eCommerce platform with available enterprise level capabilities and require a content management system to help tell your product story, WooCommerce could be the platform for you! The pair of WordPress+WooCommerce is a very affordable choice, and also one that doesn’t stay behind other, more specialized, e-commerce-only platforms. The combination of WordPress+WooCommerce is a very economical choice and with features almost comparable to a more specialized e-commerce-only platform like Magento. Magento excels at product/store features and offers a limited content management system while WordPress + WooCommerce offer the richest content management system available with less product/store features. WooCommerce is ideal for those familiar with WordPress, or for those keen to get a store up and running relatively quickly and at a lower cost. Compared to other free options, WooCommerce does have a lot to offer. However, for those considering scale, WooCommerce and WordPress can quickly become limiting without the use of plug-ins including paid ones. If you are convinced WooCommerce is the right eCommerce platform for you, then give us a shout, and we would be more than happy to talk about your project. Not quite sure? Keep reading! For starters, it runs on one of the best content management systems ever built: WordPress. The plug-ins market gives WooCommerce flexibility because today’s consumers and their buying patterns are changing by the minute. WooCommerce—open source and agile—is adaptable and ideal for lifestyle supported products. WooCommerce has a community of over 150,000 plug-ins and a network of highly-trained solution partners, like Absolute Web Services. WooCommerce has a lot to offer, but also adds tasks that a hosted solution like Shopify does not. WooCommerce is an enterprise plug-in built for WordPress. When it comes to customizing your storefront, you have a wealth of themes both paid or free. If a personalized look is what you’re interested in, Certified WooCommerce partners like Absolute Web Service can help! The journey to purchase starts before someone buys. Look-and-feel are vital to selling online, WooCommerce/WordPress give you a full range of user interface customizing options. WooCommerce is built to integrate fluidly with default WordPress themes – allowing you to keep your websites look and feel while adding e-commerce capabilities. WooCommerce has committed a lot of development efforts to improving the management of your storefront. One core feature is admin setting are structured to be used on mobile devices, giving you the ability to manage your store on the go. WooCommerce is a WordPress plug and integrates beautifully with all your valuable content! If you have invested considerable time in content and own a WordPress site, WooCommerce will conserve your time + energy investment. Shop Pages can be completely customized including product details, integrating WooCommerce widget – such as price filter. Product row and view structures are set on the backend. Single product pages automatically receive your default theme look and can be customized by editing your default theme. One last thing when it comes to storefront features, WooCommerce features THOUSANDS of free and paid plug-ins. Need to shop for an Instagram feature? It’s available in the marketplace. Want to suggest additional products to complete an outfit? Just a download away. The easiest and most rewarding part of WooCommerce manager is how accessible it is to customize, add plug-ins, and to add content. As a plugin for WordPress, WooCommerce, truly gives you a lot when it comes to managing your store front! Pre-installed payment gateways include Direct Bank Transfer, Cheque Payment, Cash on Delivery, Credit card payments via PayPal, or Credit card payment with Simplify Commerce. Drag and drop on the back-end, make it incredibly easy to set your preferred order on the front-end. Control the checkout process! Keep your checkout secure with security certificates. Control who can buy from your store with the ability to sell to specific countries. You can also set specific URLs to handle specific actions during the checkout process. WooCommerce also gives you currency and built-in geolocation support. You can configure the default currency by selecting from a range of pre-set currencies. Built-in geolocation support (with a page caching support option) allows your store to auto-detect your customer’s address – making shipping and tax calculations simpler. Geolocating the “Default Customer Location,” coupled with the ability to show taxes in your store based on their location, allows you to show relevant prices store-wide. Cart behavior: It offers ‘Selective Choose’ to redirect to the cart page after the successful addition of a product. Reduce page loading: WooCommerce optionally uses AJAX on add-to-cart buttons, which means your store won’t need to reload each time a customer adds a product or edits their cart. WooCommerce has added many core features, but it is still not as complete of an offering as Magento. However, if you are looking for something easy, with management features like drag and drop payment processing, then WooCommerce is a great option. When it comes to online store management, WooCommerce is easy to use! While the products tab is about – well, you guessed it! – your products, you will have the ability to control pricing, pictures, product title and description. WooCommerce benefits from all of the back-end power WordPress has. Managing your content, and customizing your theme and website plug-ins are done on the WordPress back-end, which is an excellent thing. Why re-invent the wheel? When it comes to website management, WordPress is exceptional. What if we have several brands with their own identity? What if we have several products that require their own independent presence? How can we efficiently manage multiple online stores? Magento is probably a better fit for your needs. How easy is it to beautify my store? How easy is it to integrate social media into my store? How easy is it to integrate my content with my store? The WooCommerce is your best bet! If you are interested in learning more about WooCommerce contact a certified partner like Absolute Web Services. Store management with WooCommerce is easy and pretty complete when it comes to content/design modifications, but it will not offer all of the features that Magento does. It would be amazing if selling online was as simple as setting up a store and customers would automatically come to you. Unfortunately, it’s not. Setting up marketing and SEO vital matters. WooCommerce is bundled with rich features that help you connect, include SEO, coupons, product reviews and more. WooCommerce runs on WordPress – recognized in the industry as one of the best platforms for SEO practices. Woo! Choose from a fixed value or percentage-off coupons; allow for free shipping through the use of coupons, and set the date the coupon should expire and can no longer be used. Cart discount (a fixed total discount for the entire cart), cart percentage discount (a percentage discount for the entire cart), product discount (a fixed total discount for selected products only), or product percentage discount (a percentage discount for selected products only). Core + Extensions make WooCommerce a great marketing platform with features that truly help you drive traffic + convert. In order to configure and activatw WooCommerce with extensions, you may require the assistance of a Certified Magento Partner like Absolute Web Services. WooCommerce has great marketing features. We will get into intangibles. These are where other platforms, like Shopify, excel in. Let’s see how WooCommerce compares to those. WooCommerce is NOT a hosted platform. However, unlike Magento, and more similar to Shopify, there are providers that have WordPress + WooCommerce hosting available. WP Engine is a highly respected provider < our affiliate link. WP Engine is very reliable, scalable, and secure. Pricing for WordPress + WooCommerce hosting typically starts at $30 per month. WP Engine’s offering is very similar to Shopify’s entry point. With WordPress + WooCommerce, an installation will be required. If you have an existing WordPress site, it is as easy as installing and activating WooCommerce. Also, if you are creating or migrating your store with a WooCommerce Certified Partner like Absolute Web Services, the installation will be included. However, Shopify is turn-key and so it offers a great intangible value. 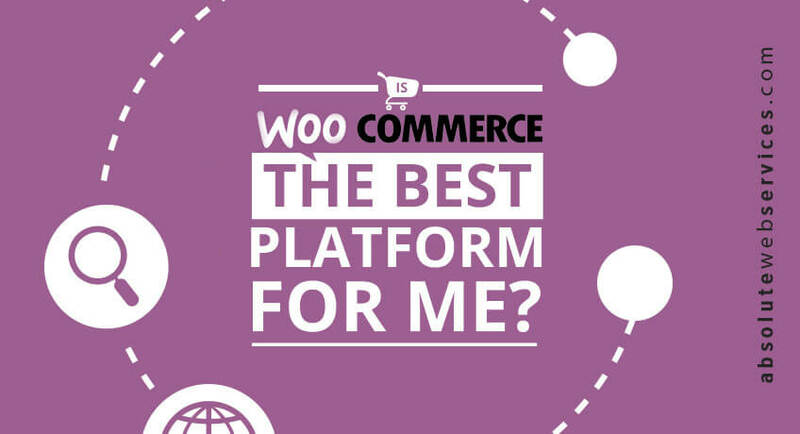 WooCommerce provides an incredible platform with reasonable on-boarding time and ease of use. Lastly, we get to pricing. WordPress + WooCommerce is free. However, you may need to invest in extensions to add needed features. Hosting will start at around $30. As your store grows, your hosting requirements will also grow. Lastly, there is the cost of development. Certified WooCommerce Developers, like Absolute Web Services, have dedicated a significant amount of time mastering WooCommerce. The cost of development is higher than for Shopify, but less than Magento. We give Magento a 40/50 that equals a 80%. If you are a new store owner, Shopify is a complete turn-key solution right for you. If you own a well-established business or have an online store that requires advanced features, product configuration, and the most advanced shopping cart + store management Magento is the right solution for you. If you are a WordPress site owner, looking to add commerce to your site, or a Shopify client with a store that has grown and requires greater control, WooCommerce is right for you. WooCommerce is also by far, the best out of the three for managing your content. When it comes to content management, ease of use, available extensions, and reasonable onboarding time, WooCommerce is 50/50! As always, this review was done with all store types in mind. WooCommerce is 100% customizable with a content management system for easy front-end editing. WooCommerce gives you incredible control to manage your website theme and content because it’s done through the WordPress back-end. Experienced store owners may find the WooCommerce + Product management tabs to be limiting, while new users may appreciate the simplicity. WooCommerce offers great marketing + SEO features, but more impressively, the collection of social media + email integrating extensions available make it a marketing force! WooCommerce is not hosted. If this is not a deciding factor for you, then you could instantly increase this rating. WooCommerce is also much easier to onboard than Magento, but not as turn-key as Shopify. WordPress + WooCommerce are both free. However, you may have to invest in extensions to add all required features. A Certified Developer like Absolute Web Services can guide you and help you with the installation. WordPress + WooCommerce can easily be modified to be what you need it to be. We highly recommend WooCommerce to store owners that sell lifestyle products and require the maximum support for content creation with the availability to beef up the commerce side with extensions.